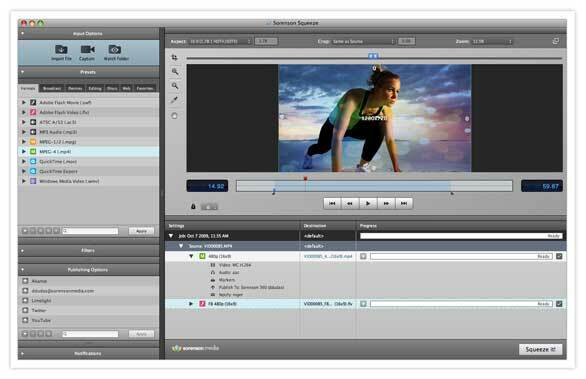 Sorenson Media has released Sorenson Squeeze 6, an update of its video encoding software package. This version is designed to let users more easily encode and publish video to the internet. It adds e-mail and text notification capabilities, a secure review and approval process, optimized video codecs, and new filters to boost quality and encoding speed. “Sorenson Squeeze 6 is not just a powerful, high-quality application—we call it the first total video workflow solution,” said Peter Csathy, CEO of Sorenson Media. “We made it better and faster, but we also made it a lot smarter. Our goal was to take away all the workflow pain points for video professionals and make their lives easy so that they can concentrate on what matters most—their videos, their businesses, and their lives." Working alongside the Sorenson 360 Video Delivery Network (the company's online video publishing platform), Squeeze 6 includes several new features, such as the ability to send automatic notifications to clients, colleagues, supervisors, friends or the users themselves via e-mail and text message (SMS) when encoding jobs are completed. Video pros can now add contact information to the program, which will automatically send clients or supervisors secure, password-protected videos for review and approval after encoding jobs are completed. 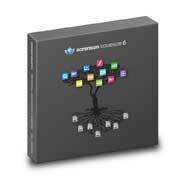 This automated workflow is accessible from desktop Web browsers and the iPhone. After viewing a video, reviewer feedback and comments are immediately sent back to the Squeeze user, thus streamlining the workflow. In addition to publishing to the Sorenson 360 Video Delivery Network, Squeeze 6 users can upload high-quality encoded files directly to social media sites such as YouTube and Twitter, as well as to content delivery networks, including Akamai and Limelight. Squeeze 6 also includes a complimentary one-year Review & Approval account to the Sorenson 360 Video Delivery Network. The account includes 5GB of storage, 100 streams per month, and a maximum video length of 30 minutes. The program’s interface has been re-designed to simplify the video compression workflow and provide easy access to features such as encoding presets, high-quality audio and video filters, DVD burning tools, and the new review, approval and notification functions. Sorenson Squeeze 6 offers enhancements over previous versions in both speed and quality by incorporating and optimizing the latest On2 VP6 and MainConcept H.264 codecs, the company says. According to Sorenson's internal benchmark tests, Squeeze 6 is up to 250 percent faster than Squeeze 5 when encoding in the H.264 and VP6 formats, both of which are standard formats included with Squeeze 6. New video filters have also been added, including blur, RGB, tint, white balance, and timecode. Sorenson Squeeze 6 also includes new input and output formats: On the input side, there's AVC-Intra and WMV with VC-1 for use in Blu-ray and Microsoft Silverlight; on the output side, there's AVI, AIFF, DV Stream, Image Sequence, Wave, and WMV with VC-1. In addition, Sorenson Media has launched a new Preset Exchange, an online repository of professional "video encoding recipes" or presets, created by compression experts. This provides Squeeze 6 users with direct access to the same encoding tools used by seasoned encoding professionals. The Preset Exchange is integrated with Squeeze 6, so users can import new presets into Squeeze by clicking Install on the Preset Exchange Web site. Along with its previous integration with Avid’s suite of editing applications, Sorenson Squeeze 6 now works with Apple’s Final Cut Pro and iMovie. This significantly improves workflow times by eliminating the need for exporting and importing between applications and enables users to access Squeeze features directly from their Apple software. Sorenson Squeeze 6, along with Sorenson Squeeze 6 for Flash, are available now for electronic download or on CD. Sorenson Squeeze 6 is $799 and Sorenson Squeeze 6 for Flash is $499. Upgrades from previous versions begin at $199. The program requires an Intel processor and OS X 10.4 or later. A webinar with more details about Sorenson Squeeze 6 and Sorenson 360 will be held today at 1:00 p.m. PST. Participants can register now for the webinar.